The February issue of Young Ace will celebrate its 100th issue with a special cover featuring the magazine’s all-stars characters. Kazahaya is making an appearance representhing Drug & Drop. The magazine will also give a QUO card as a present to 100 lucky readers via lottery. Drug & Drop remains on hiatus but this bit of news probably means that Young Ace will still be the home of the series when/if the serialization is resumed. The magazine goes on sale on December 31st. omg!! looking super quickly at this post i got sooo excited cause i thought it was saying drug and drop will resume in the new year. but then i read properly when i had the time and saw it wasn’t…. but still! always happy to see kaza!! and even happier that the magazine is still happy to house drug and drop when the boys are back in business. you know i always thought drug and drop was gona be looong like holic or tsubasa, like be stuck on monster of the week plot for quite a while before picking up the pace and getting darker. but that all happened way sooner than i thought in the last arc. anyway, im happy to wait as long as there is still hope! I am always careful when posting these news ^^” I don’t want to give people false hopes. D&D was supposed to be 15 volumes long — that’s pretty long! I don’t know if the plan has changed tho. I feel that some of the arcs in XXXHOLiC were originally planned for D&D but since XXXHOLiC became more popular, CLAMP used them for it instead. I hope one day to post the news about the return of D&D! 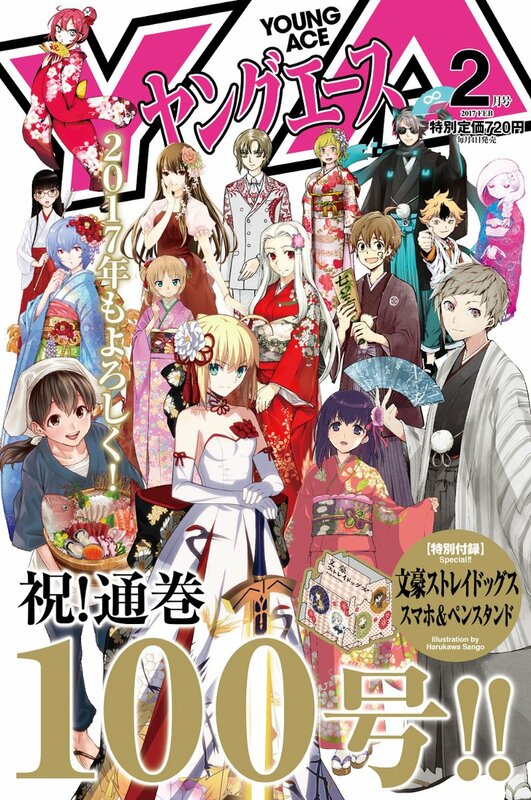 We sadly have to wait for the 100th Anniversary of a magazine to see new artworks of series on hiatus: it was the same with the 100th issue of XYZ (I don’t remember the name of the mag) in which we got a new illustration of X.
It’s truly a shame for Lawful Drug/Drug&Drop: unlike X, Gate7 or the forever on-going Tsubasa/xxxholic, which all have still a long way to go, it really feels like CLAMP could have definitely ended the series with a just one more push, maybe 1 or 2 more volumes? And it would have been done with… It’s unfortunate they let go so soon after taking the time and effort of reviving the interest in this series by re-releasing the old volumes with new covers and even coming up with a new name for the series: now, with the exception of the big fans, D&D will once again be ‘forgotten’. Is it a sure thing that the QUO card is included inside the magazine? And is the illustration the same as the cover? I think it was ASUKA’s 25th Anniversary, for X I mean. Exactly… after all that trouble. D&D was supposed to be 15 volumes but maybe the plan changed since it did seem like it could have ended in 1-2 more volumes.